Looking for a super dreamy, cute as a button, mountainous green getaway city that almost no one knows about? 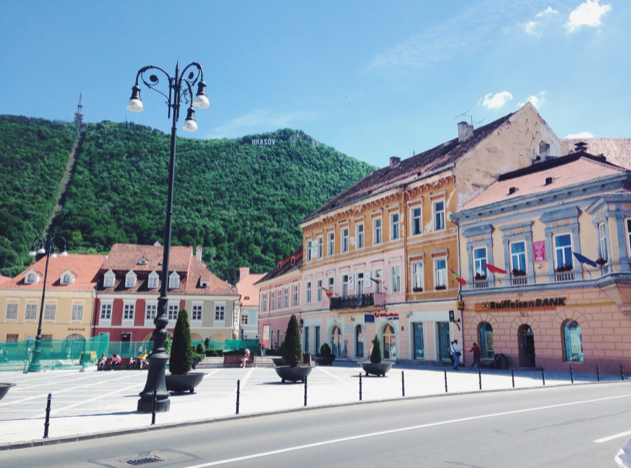 If you only can choose one place to visit in Romania, choose Brasov! This Romanian city will steal your heart. 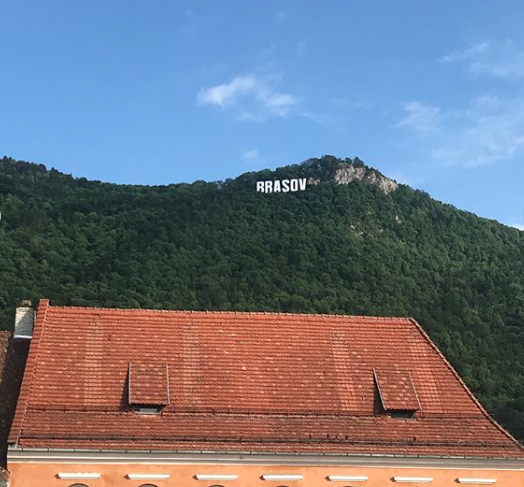 It’s a huge bucket list spot because it is near Brasov the castle which inspired the legend of Dracula .... plus this city is as cute as can be. Complete with its own “Hollywood sign” and streets full of charming buildings that are pale yellow, creamy pink, and faded orange, it’s easy to fall in love with. 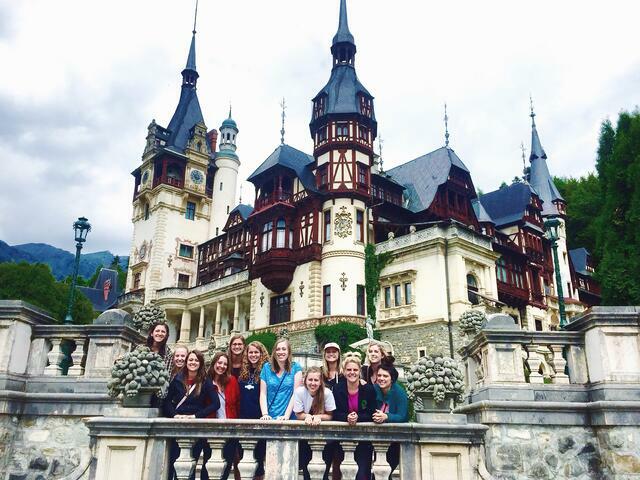 ILP Volunteers who are living in Romania for a semester cannot get enough of this gem. Interested in life in Europe? We have guide all about volunteering in an orphanage, right here. 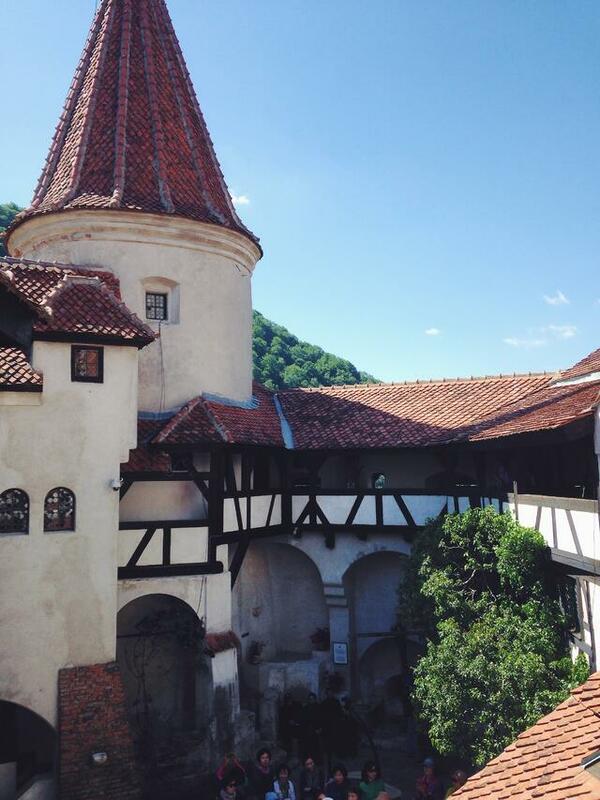 Volunteers live in Romania, and have free time, weekends off, and vacation days to see places like Brasov. 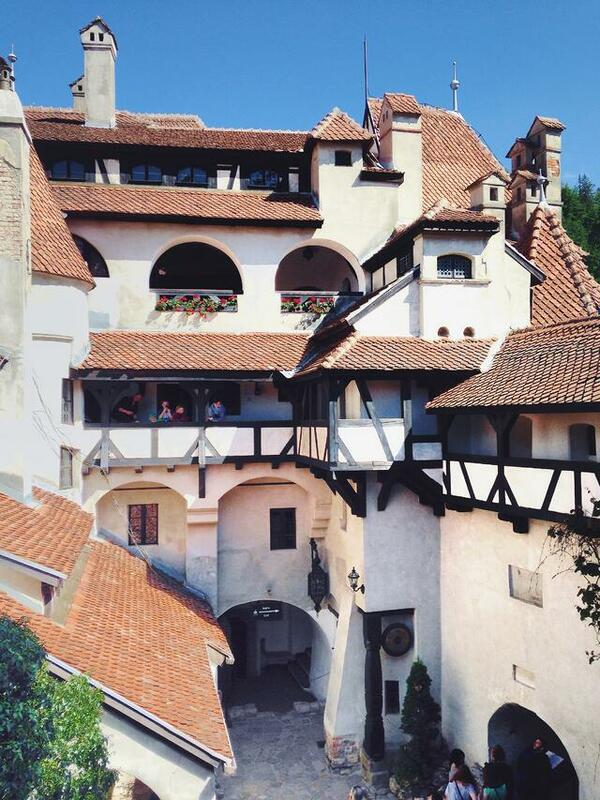 Found basically right in the middle of Romania, Brasov is in the Transylvanian region of the country. The main city center is historic and iconic, displaying medieval architecture and baroque buildings painted in pretty pastels, and topped with red-tiled roofs. We told you this place was cute. Our pick is traveling by train. Not only is it an adventure (at one point, be sure to stare out the windows to see the gorgeously green, mountainous countryside dotted with quaint villages speeding past you), but it’s also a good option for volunteers who call the city of Iasi their home. You can also take a long distance bus to Brasov from Iasi. It’s about a 10-12 hour train or bus ride, which makes it a good pick for an overnight option. You can leave Iasi in the evening, and arrive in Brasnov in the morning. Perfect. Plus, tickets are only about 13-18 Euros which we also love. Head’s up: there are two train stations in Iasi, so be sure you know which once you are booking tickets for. Virail is a good site that can give you the bookings and listings for several train/bus companies, letting you choose the time and price that works best for you. You can also use this option to see what the train schedule looks like from a lot of other cities in Romania. There are 18 daily trains that leave Bucherest to Brasov, so you should be able to find a route that works for you. Once you arrive in Brasov, it’s fairly easy to get around. You’ll mostly be hanging around Old Town (more about that later) but a public bus system and taxis make getting around Brasov + nearby towns fairly easy. It’s also a popular tourist destination for a lot of Romanians and Europeans, which means you’ll probably stumble upon people who speak English and are willing to help you out. Google Maps will come in handy to help you get around; it’ll pull up the local bus system and give you pretty accurate bus/walking directions. Head to Bus Terminal 2 (Autobuses 2) to catch a bus outside of Brasov to nearby Bran, Rasnov, and others. This is an absolute don’t miss city in Romania, so even if you can only visit on a weekend (ILP Volunteers get Saturday and Sunday off), do it. Groups have also visited on a 3-day or 4-day weekend and “haven’t regretted it” according to one ILP Romania volunteer. A weekend trip will be a bit busy, but past groups have said to just find a time to visit, whenever works — just don’t skip out on Brasov. Little shops and restaurants line the main city square creating a darling Old Town. You’ll find quite a bit of souvenirs here; things like Romanian rugs and more expensive gifts in the stores. You’ll find cheaper souvenirs in other places (like around Bran’s Castle or a different city like Bucharest) but it’s fun to window shop. 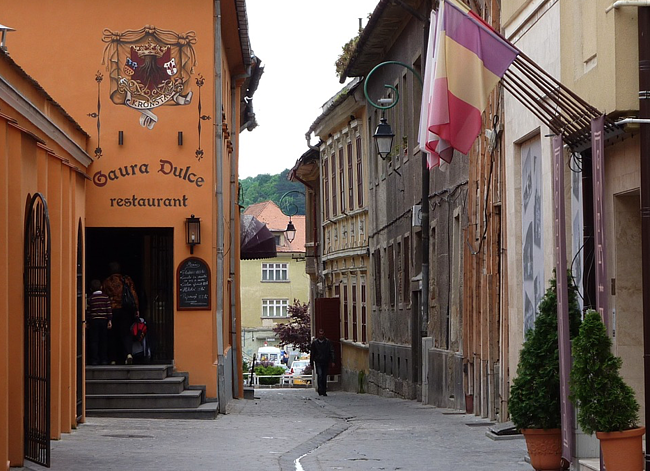 If you have time, you might want to do a walking tour of the area; you can do a quick search online “Brasov Free Walking Tour” and go with a guide if available or find a self-guided one, (like this one), or just wander around. Found in Old Town, this towering cathedral was originally built in the 1300’s (wow). It was partially destroyed by a fire in the 1600’s but it’s been restored so you can soak in the sites of the largest Gothic church in all of Eastern Europe — 5,000 people can fit inside! It’s gorgeous and impressive to see from the outside, but past volunteers highly recommend visiting when the church is open. From April - September: 10:00 AM - 7:00 PM, Sunday 12:00 PM - 7:00 PM . Closed Monday. From October - March: 10:00 AM - 3:00 PM, Sunday 12:00 PM - 3:00 PM . Closed Monday. If you’re visiting between June and September, you can pay an extra 10 lei to attend an impressive 400-pipe organ concert every Tuesday at 6:00 PM. Another favorite spot around Old Town, this is a short ctivity but it so fun. 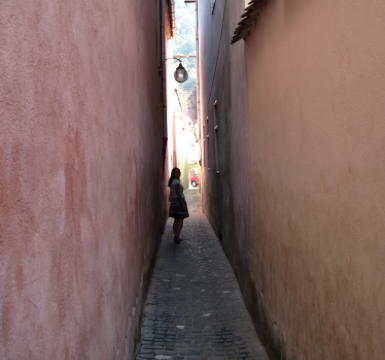 Brasov has an incredibly narrow street called “Rope Street” (Strada Sforii) that makes for a cool photo op … it’s one of the narrowest streets in all of Europe. Rope Street runs perpendicular to Strada Poarta Schei; it should pop up in Google Maps and get you to the right area. Past volunteers mention needing to hunt around a bit once you “arrive” according to Google Maps, but it’s in the area, so just keep looking. Situated above Old Town on the slopes of the green alpine hills, you’ll see the city’s named spelled out, ala-Hollywood style. It’s quite a strenuous hike to get up there, which is why we say to opt for the gondola ride up. You can ride up Tampa mountain for about 18 lei which will get you to the top. A 5-minute hike gets you behind the sign, and to the best views of the city. Just about 10 miles outside of Brasov (so not technically Brasov .... but close) this fortress is perched high above the city, and has been for about 700 years. You can either hike up or take a cable car up to the entrance, before you can tour the maze of streets hidden inside the fortress. The views from up here are stunning. 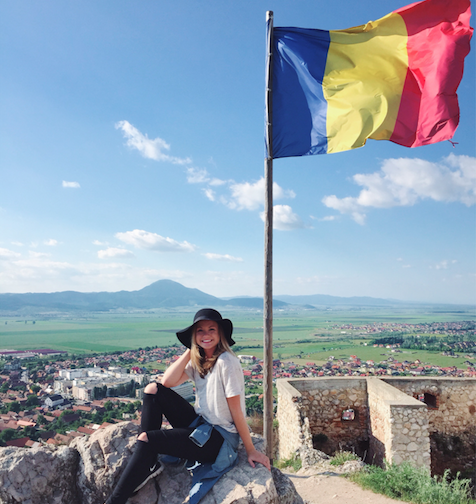 Inside, there’s a highpoint with a Romanian flag mountain on top … be sure to snap a picture before making your way down and back to Brasov. Getting Here: Head to bus terminal 2, and get a ticket to Rasnov (the #16 bus gets you to the bus terminal if you’re leaving from Brasov). Tickets cost 4 lei; buses run every 30 minutes daily, or every 60 minutes on the weekends. You can also take a short taxi ride (it shouldn’t cost more than 45 lei or so, so not bad if you split the cost). Once you arrive, ask where you can catch the funicular up to the fortress’s entrance. 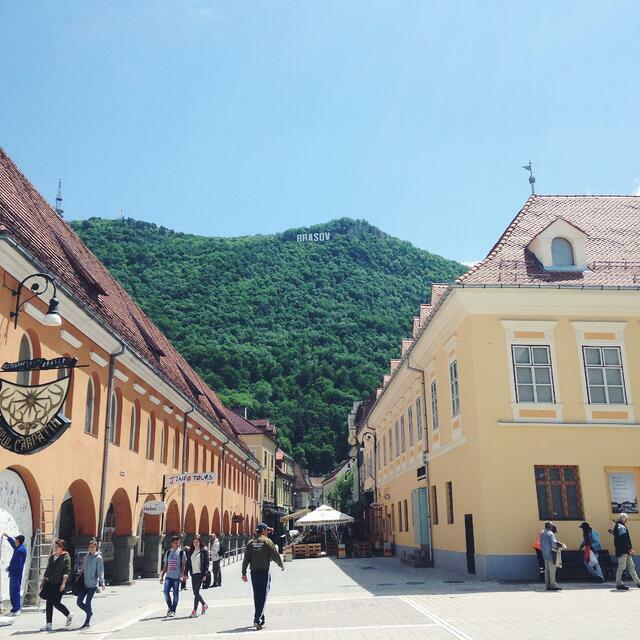 We love Brasov, you absolutely can’t visit without heading to either Bran of Peles Castles … we recommend doing both! Found in the nearby city of Bran, you might know this better as “Dracula’s Castle”. Iconic and imposing, this hilltop castle inspired the legend of Dracula and is one of the main reasons why you visit this region of Romania. 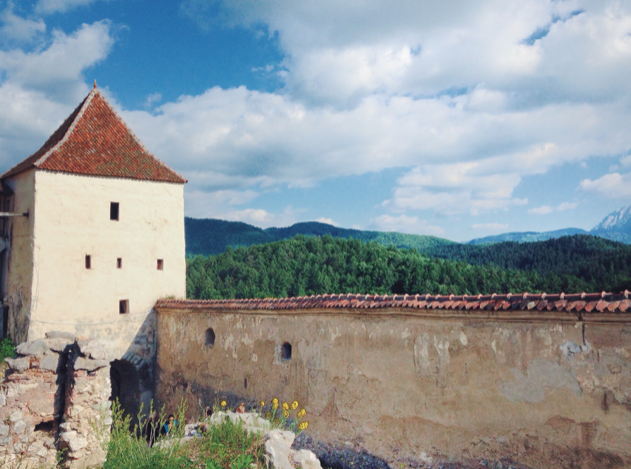 There's a reason this castle made the top of our list of the top five castles in Romania! The castle is said to be the only one in all of Transylvania to match Bram Stoker’s description in the novel, hence the idea that Bran’s castle inspired Dracula’s home. It’s very touristy in the best way; you’ll see posters and advertisements about Dracula all over the place, but once you go inside, it’s like a museum. Read up about the castle’s real history here. Head’s up — Fall volunteers, be sure to check online about any Halloween events that happen in Brasov; there are usually some cool festivals happening in October. Outside of the castle, you can get a few Transylvanian-inspired souvenirs; things stamped with Dracula’s picture and name, and other Gothic-inspired knickknacks, like pottery etched with snacks and ghouls. Getting Here: Buses leave for Bran every half and hour from Bus Terminal 2 (tickets should cost around 7 lei). It’s about a 35 minute bus ride away. Tickets To The Castle: 40 lei (Visit the official website for more information). This is HUGLY recommended; one ILP Romania volunteer said that Peles is “what you think about when you think of a castle”. This place looks like something out of a movie. 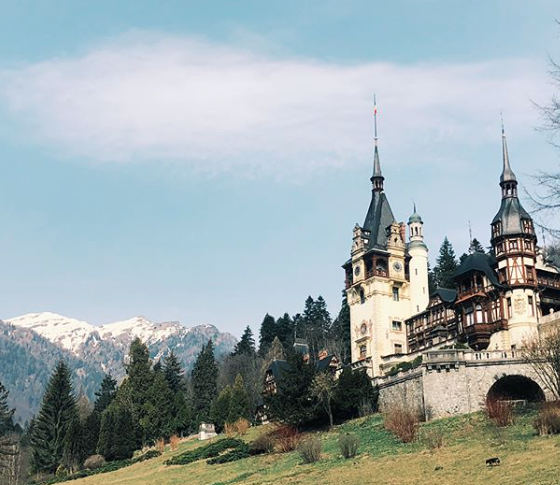 Peles is perched between sloping alpine mountains, found in Sinaia which is outside of Brasov technically, but it’s so stunning it would be shame to miss Peles when you’re visiting Brasov. The outside is incredibly impressive, but inside, you’ll see what you’d expect of a royal residence (we’re talking lush ornamental rugs, vaulted ceilings with detailed chandeliers, rich wooden doors that are intricately carved …. you know, total luxury). Good to know: On the grounds, there is also an impressively pretty and old monastery (it costs 5 lei to enter, 10:00 AM - 4:00 PM, Monday - Saturday) who’s garden path will lead you to the entrance of Peles; it’ll be lined with other souvenirs, like carved wooden ornaments, embroidered shirts, rugs, etc. Getting Here: You can take a bus, but the timetable is a bit spread out; past volunteers say it’s worth it to hail a taxi and split that with your group instead. It's about an hour drive. Tickets: Depends on what floors you’d like to see. First floor tickets are 20 lei, second floor tickets are 50 lei. If you have the budget, pop for both floors (They are spectacular!). The entire country of Romania is blanketed with an impressive number of national parks, and people from all over flock to see some of Romania’s untouched landscapes. 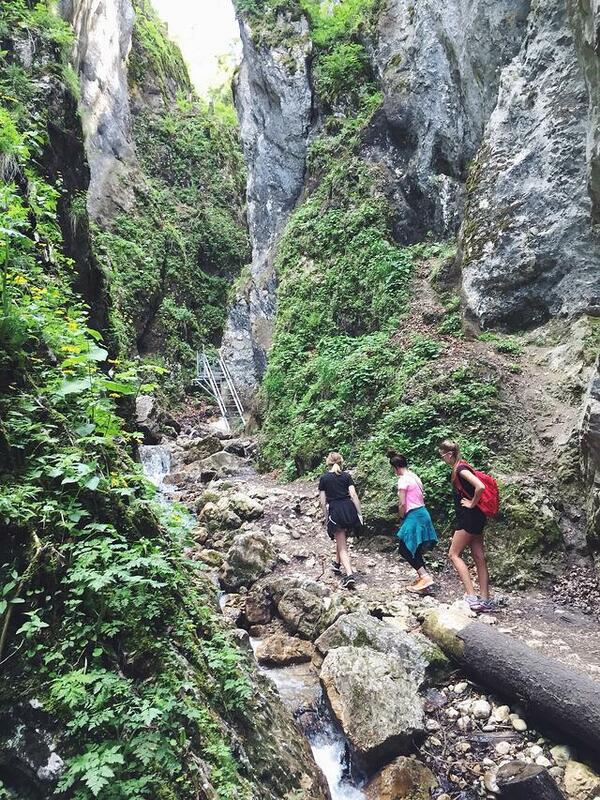 The nearby Canionul Sapte Scari (Seven Ladders Canyon) is a good option for hikers staying in Brasov. Like the name might suggest, you’ll climb seven ladders in a deep canyon, over waterfalls and through rolling forests. It’s gorgeous. Walk south of the Timisu de Jos Village, from the point called “Dimbul Morii”. 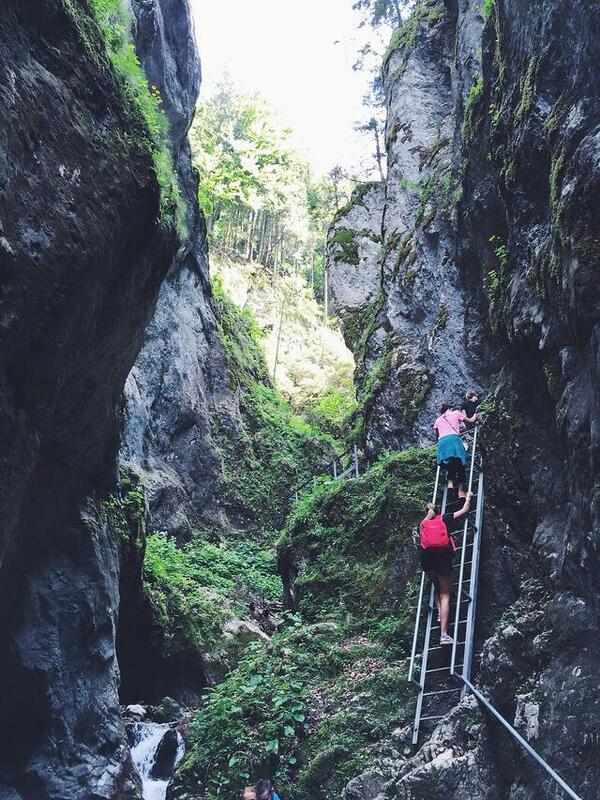 Start hiking on yellow stripe track, which takes you through the Seven Ladders Canyon. You’ll trek through the hillsides before reaching the canyon which is where you’ll encounter the ladders (there’s a small fee to hike through this section). Once you exit the canyon, you’ll reach Piatra Mare Hut where you can get snacks and drinks. Then, you’ll make a loop through the forest to get you back where you started. It should take 6-8 hours total. Head’s up: the ladders can be steep and are situated in the canyon, so it might not be ideal for someone afraid of heights. You will want to be wearing solid hiking shoes. The waterfalls can make things slippery so go slowly to keep your balance. Tip: The Tourism booth in Brasnov is very helpful when it comes to planning your trek here. Getting here: Taxi to the village Timisul de Jos, where the trailhead is. Your taxi driver should know it (it should be about a 15 minute ride from Brasov). It might be helpful to talk to your hostel staff or the tourism booth to see if you can go via a guide to help you navigate the hike. Cost: About 10 lei to enter the trailhead, plus more to climb the ladders. Getting back: There is a little snack shed at the trailhead; the lady inside speaks English and can help you figure out the bus back to Brasov, or call a cab. Or, if you’ve gone with a tour (talk to your hostel or a nearby hostel in Brasov) they will probably include transportation. There are a few places to stay in this city, but ILP Romania volunteers have had good luck and fun at a couple places, which are below. ILP volunteers loved this hostel for a helpful staff that can help you book tours to all the things you want to see and do around the city, plus they have a pretty central location. Kismet Dao Hostel also offers a free breakfast (with free coffee and tea all day long), plus a cool yard and terrace area to hang out in. Dorm beds are around $13-16 per night. This hostel has great staff that can help you set up tours all in and around Brasov which is really handy. The Rolling Stone Hostel also is pretty easy to get to. There are also free lockers handy where you can lock up your things while you’re out adventuring. Dorm beds are around $11-14 per night. Something keep in mind: AirBnb is also a good option for Brasov. Just know that there are several little skiing villages and resorts in the mountains around Brasov with cutie AirBnb’s but that mean you’ll need to take a 30 minute bus or taxi ride into the city. The views are stunning there, but we recommend booking a place as close to or in Old Town since that’s where most of the activities are, or where you can catch a bus to visit Bran, Rasnov, or Sinaia.